OLD PARKED CARS. 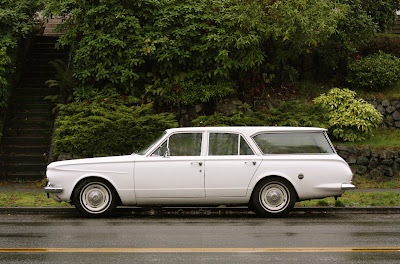 : 1964 Plymouth Valiant Wagon. Way to go Tony- good post. I always liked these better than the funkier first gen Valiants. Damn the crossovers... America needs to get back to the station wagon mentality. This is a really cool valiant. Really attractive. I love station wagons and this one is super. Dig the slant on the pillar by the back door and the clean appearance at the rear of the car by the tailgate. Very clean execution. Makes me wonder what one of these things goes for on the open market these days. my dream car, on a certain level. if i had to choose between this one and this one, i don't know what i'd do. Awesome. The color, the color-coded dogdishes, mixed with the design-makes a perfect 60's wagon. WOW I,ve never seen a valiant wagon before. 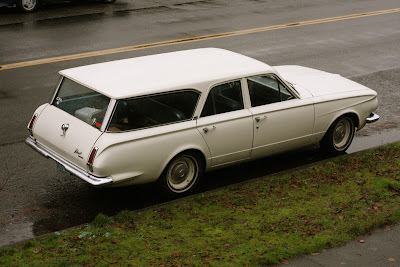 I own a 65 4 door, but i've never seen a stationwagon. thats one kickass car though. This gem was on craigslist a few months back for under $3k who ever bought it got a killer car. This was my first car. I bought it in 1977 for $100. With the limited slip differential it was a great snow car. That's my old car! Sold it a few years ago in Tacoma. Would you be interested in buying 65 station wagon - Plymouth Valiant? 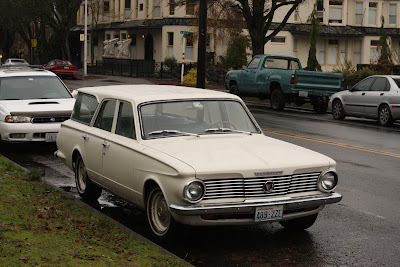 Anyone interested in buying a 1965 Plymouth valiant wagon? i'm interested. send an email to oldparkedcars@gmail.com.